Recently there has been an increasing amount of media coverage on the controversial name of Washington D.C.’s NFL team, the Redskins, but they are not the only professional sports team to have a native association in their team name and logo. 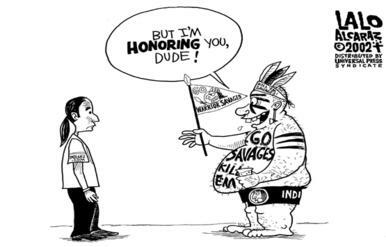 The Atlanta Braves, Kansas City Chiefs, and Florida State Seminoles are just a few more examples of teams who have been called out for their use of people as mascots – But there is a world of difference between paying homage and mimicry. This article magnifies ways in which a team can acknowledge and respect native people, tradition, art, and culture by examining the Seattle Seahawks. Also included are perspectives from Pacific Northwest natives and their conjunction with Seattle’s home team.